The services of our shop are the rental service and the sale. The category of the rental service has the rental bicycle and the rental outdoor gear such as a climbing and a camping. The other category sell the outdoor gear and our original T-shirts. Today, we’ll show you our original T-shirts. This t-shirt dyed Japanese blue on the cotten t-shirt. And this design is Japanese craft design. The name of each design is from top to clockwise, “Kasanoha”, “Shippo” and “Uroko”. This t-shirt is palodied from the famous phrase from the famous SF movie. May Mt. Fuji be with you! The number “3776 “is the altitude of Mt. Fuji. Let’s wear this t-shirt and feeling the altitude of Mt. Fuji! The model of this character is princess Konohanasakuya in the folk tale of Kawaguchiko. The t-shirt is printed the climber on the summit of Mt. Fuji. You might feel thinking of the climber on this t-shirt when you wear it. This design is designed by Shuji that is japanese traditional writing style. And this design is printed back of the t-shirt. Mt. Fuji is one of the spirit of Japan. From the feeling, we wrote the message that is “We love Mt. Fuji” on this t-shirt. The colors of this t-shirt are blue, dark-red and purple. The japanese bullet train runs around Mt. Fuji. And 1. Mt. Fuji, 2. a hawk, 3. a eggplant bring good fortune in Japan. The sentence is that “Fujiyama” means Mt. Fuji. Let’s wear this T-shirt and to get good fortune. The illust of this t-shirt is made by the sentence of “Mt. Fuji”. And we hope all people to become smile when you wear this t-shirt. We wrote Mt. Fuji by chinese characters. If you wear the t-shirt, you can get good impression from other people. Mt. Fuji is registered with World Heritage by Unesco in 2013. We wanted to make the t-shirt that was in memory of it. The t-shirt is three colors, Khaki, Beige and Black. If you follow “soranoshita.kawaguchiko” in Instagram and post with our hash tag when you pay in our shop, you can try the lottery for t-shirt. People who win the lottery will get our original t-shirt!! 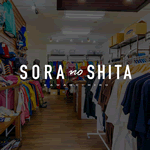 Soranoshita Kawaguchiko has rental service for outdoor clothes and gear. If you are going to rent outdoor clothes and gear at our shop, you do not need to make a reservation in advance. It will be only while supply lasts, but all of essential clothes and gear can be rented.